For the paperback edition, Kay, Ph.D., updated the entire book and added the afterword exploring the potential impact of rock music since the election of President Donald Trump in November 2016. The paperback edition will be released Nov. 7 by Rowman & Littlefield Publishers. Recent examples of the power of music, Kay states, include the aftermath of the February shooting at Florida’s Marjory Stoneman Douglas High School that killed 17 students and staff and wounded 17 others. 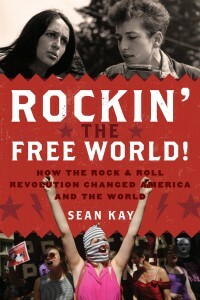 In the body of “Rockin’ the Free World!” Kay explores how music has influenced issues ranging from racial justice and gender equality to political revolution and anti-war activism. The book includes interviews with musicians, industry insiders, journalists, and activists including two-time Rock and Roll Hall of Fame inductee Graham Nash, recognized by the hall as a member of both Crosby, Stills and Nash and the Hollies. Cameron Sears, former manager of the Grateful Dead, also shared thoughts on rock music’s impact on society. Serj Tankian, lead vocalist for System of a Down, told Kay that it’s important to remain optimistic. At Ohio Wesleyan, Kay has been a member of the Department of Politics and Government since 1999. He also directs OWU’s International Studies Program and is an associate of the Mershon Center for International Security Studies at The Ohio State University. Kay earned his doctorate in international relations from the University of Massachusetts at Amherst. Learn more about Kay and his background at www.owu.edu/seankay. Read more about “Rockin’ the Free World! How the Rock & Roll Revolution Changed America and the World,” at https://rowman.com.